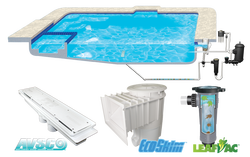 The EcoSkim Venturi-Powered Automatic Skimmer dramatically enhances surface skimming action through the effectiveness of the venturi which removes most debris before it sinks to the bottom of the pool. That’s like getting the performance of an additional pump with out the cost or the energy to install one. Talk about GREEN! LeafVac™Debris Removal Canister automatically removes leaves, insects and other debris, powered through the full pump suction from the pool’s equipment to the floor of the pool through the AVSC Channel Drain. This powerful debris removal capability is thanks to the A&A EcoSkim being venturi operated and requiring no active suction from the pool equipment pump. This is what separates A&AMax system from the competition. A&AMAX is the only system that maximizes the use of multi-speed filter pumps. A&A EcoSkim will be operating at full skimming power (50 to 75 GPM) whether the filter pump is in low or high speed. Talk about GREEN, this is like having a 1 HP pump operating with no costs! A&AMAX protects your pump by trapping debris with LeafVac™ and EcoSkim, before it can reach the pump. A&AMAX allows your pump and filter to operate more efficiently saving both time and money.